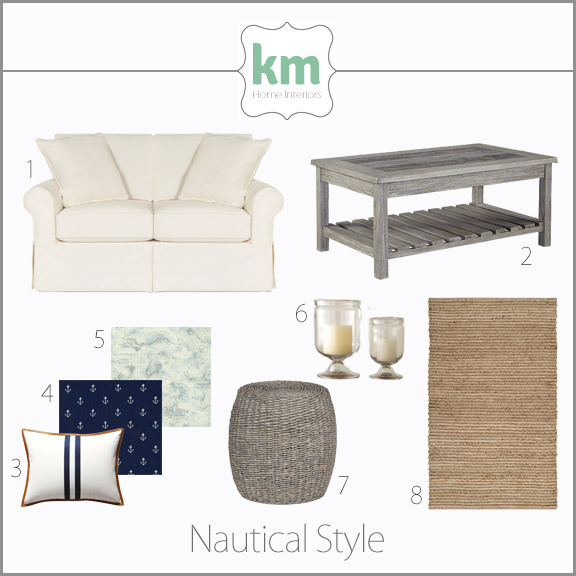 This month’s Design Style Guide focuses on Nautical style. Easily recognizable, but not easy to pull off as it can quickly go from chic to tacky if you go overboard. I’ll break down this classic style so you can achieve that breezy summer cottage vibe. Definition Nautical refers to the upscale style that gets its inspiration from the sea. A Nautical home is both sophisticated and comfortable. This style is a distinctly Northeastern look, whereas Coastal style represents Florida and the Keys (a unique look to be covered in a future post). Think of oceanside summer destinations like Nantucket, Cape Cod, and the Hamptons. History You can credit the Kennedys for introducing the country to this look in the early 1960’s. It was the prevalent style of homes in their favorite vacation spot: Hyannis Port. An upscale summer destination on Cape Cod, the homes of Hyannis Port defined what we now all know as Nautical. In the 1990’s, the popularity of brands like Tommy Hilfiger, Ralph Lauren, and Nautica helped to further refine Nautical home decor. Spot the Style Everyone knows Nautical when they see it. Open, airy rooms featuring blue and white stripes, gold accents, weathered wood, anchors, rope, and seashells make up this relaxed yet chic look. This style makes you feel like you are in the Hamptons with its upscale touches like white on white, while also making you feel right at home with overstuffed sofas and wicker accent pieces. Notables Living in New England, I’m surrounded by amazing designers who can effortlessly pull off a Nautical look. I’m especially loving Nantucket-based designer Carolyn Thayer’s work. Her ability to add just the right amount of starfish and anchors to a space is impressive. Like I said, it is really easy to go overboard with the Nautical decorations, and Carolyn never does.